Margaret Bourke-White was born in New York City and worked as a freelance news photographer for Life magazine for most of her career. She amassed a deeply moving portfolio documenting the wars and revolutions of the 20th century. 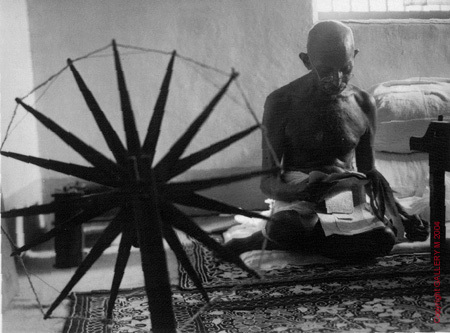 Her most famous work for Life includes this selection from a photo essay on Mahatma Gandhi, the pacifist leader of India's campaign for independence in the 1940s. Gandhi preached his cause by personal example. He spun his own cloth, as seen in this photograph, to help teach his people the value of self-reliance for a nation that would be free. Bourke-White, Margaret. Mohandas K. Gandhi – 1946. Time & Life Pictures - Getty Images.Accessed 24 June 2010. “A Life Less Ordinary | People & Places”. smithsonianmag.com. Accessed 25 June 2010.